In the last blog “6 Benefits of eCommerce Personalization” we had established the benefits offered by an optimal personalization strategy; which, just to reiterate, begins with the focus on objectives and the target audience. 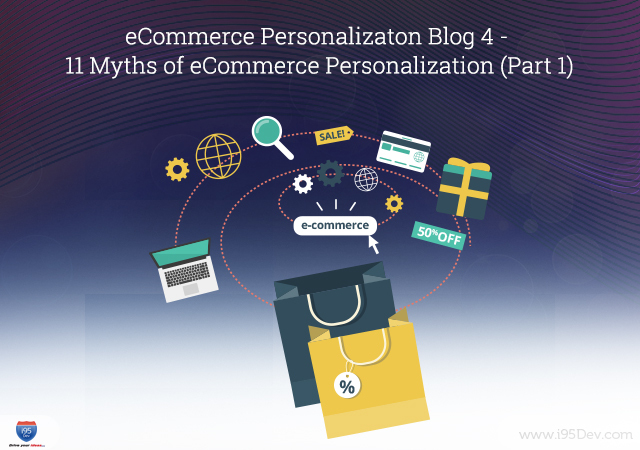 It is in this context that it is important to understand and debunk the myths associated with eCommerce personalization. If you have not already read the previous blogs in the series we encourage you to do that; Blog 1 – how the concept of eCommerce personalization evolved, Blog 2 – data you can leverage to arrive at the right ecommerce personalization strategy and Blog 3 – 6 Benefits of eCommerce Personalization. Let us begin with this piece of statistics- Over 75 % percent of consumers like it when brands personalize messages and offers; 61% still prefer it if it means loss of privacy ( browser history is tracked). While this was in 2014; the numbers are continuing to climb. This is one of the most cited myths surrounding personalization; primarily because, the foundation of the exercise lies in profiling visitors (gathering and analyzing data) and the content being delivered to them ultimately. Businesses often believe that personalization requires collecting a lot of user data over a long period of time, using complex data mining tools to draw insights and expensive personalization tools to use those insights for personalization. There are various levels to personalization and even basic personalization techniques, which do not cost a lot of money or require a lot of data or time, like addressing the user by name on your store can do a lot of good for your business. Moreover, you do not have to start from scratch or reinvent the wheel – most eCommerce platforms today have features inbuilt into them for these basic personalization techniques. For other less complex ones, there are multiple free apps and extensions available which can be plugged on and put to use immediately. This belief is largely fueled by the belief that personalization requires a lot of time and capital (Myth 1). But, irrespective of the size there is always an audience available for your store and therefore, it is important to focus efforts on targeting them right. Most personalization tools and services have options to cater to businesses of varying sizes; based on budget product/ service attributes on your website. While some advanced personalization technique requires a lot of historical data to draw insights and a lot of content to effectively use those insights others can be very effectively used with the data you already have. With effective segmentation and intelligent tweaking, you can very easily direct customers to product pages, blogs, ads/offers which are already available in your website. Moreover, a number of personalization tools do not require you to collect and save a lot of historical data and work on the real-time data available; triggers like customer actions. For example, an automated abandoned cart recovery email system that can also help entice customers to get back to completing their order. Most of these tools are mainly driven by heuristics and algorithms and just imply one thing- optimal use of time and resources as well. They work on the data (however limited) that you already have and build on top of that. Personalization can applied to any range of products. At the end of the day remember, personalization is not about a product or industry, but rather about your consumers. Personalization can be applied to all products and across industries (B2B or B2C). While not apparent, personalization has always been used in businesses in the physical world. Remember the owner of your frequently visited store greeting you by name, those small talks with the sales representative leading to the perfect product, sales representatives send you recommendations about products that might interest you and more. The first and foremost misconception and a major hindrance to personalization is considering your customer to be digitally paranoid. In other words, assuming that your users do not want you to track their behavior even if, it means an improved shopping experience for them. Consider this, over 75 percent of consumers like it when brands personalize messages and offers; 61% still prefer it if it means loss of privacy (browser history is tracked). If it means trumping ethics over utility then e-businesses are certainly in this for the long haul with a loyal following of consumers. Targeted promotional messages and emails garner in more attention than the random advertisement to the masses. An accurate eCommerce experience translates to consumers paying more attention to offerings of a particular brand and thereby performs a desirable action. There are statistics to prove this. A word of caution – There is a thin line between leveraging user data to improve customer experience and misusing the same data to haunt them. Users are comfortable sharing a lot more information with businesses when they are informed about it and when they are sure that the data will not be mis-utilized. Stay tuned for the second part of the blog!